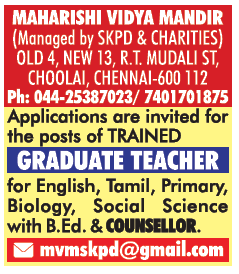 Maharishi Vidya Mandir, Chennai has advertised in THE HINDU newspaper for recruitment of Teachers TGT jobs vacancies. Interested and eligible job aspirants are requested to apply immediately from 31st March 2019. Check out further more details below. About School: With the blessings of His Holiness Maharishi Mahesh Yogiji, the school came into projection during the year 1983 with the motto “Knowledge is structured in Consciousness”. It is a co-educational school following the re-organised pattern of education of 10, +2 years of the Central Board of Secondary Education, Delhi for the classes from Std I to XII. Transcendental Meditation, Yogasana and Pranayama is the integral part of the Curriculum.